Now that we’re well into autumn over here, I like to bring out the richer, more velvety nail colours! 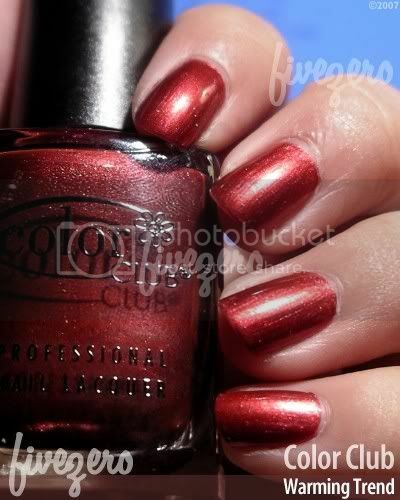 Color Club’s Warming Trend, from this year’s holiday collection, is a rich russet red shimmer. It has the faintest flash of a cool-toned berry, but only in dim, cool lighting…such during an overcast day. Mostly it just reminds me of OPI’s Smok’n in Havana, which means I find it slightly boring. It’s a pretty one if you like very warm reds, though. Rating: 3/5.